The true story of a lost dog’s journey and a family’s furious search to find him before it is too late. Saturday, October 10, 1998. Fielding Marshall is hiking on the Appalachian Trail. His beloved dog—a six-year-old golden retriever mix named Gonker—bolts into the woods. Just like that, he has vanished. And Gonker has Addison’s disease. If he’s not found in twenty-three days, he will die. The search begins. Fielding and his father, John, are dispatched to the field. They have the family’s other dog, Uli, in tow. Combing the trails, Fielding and his father bond like never before. Fielding’s sister, Peyton, calls and talks him through some of his lowest moments. And—at home—Fielding’s mother, Virginia, sets up a command center. Virginia becomes a field general. With a map and a phone book at her side, she contacts animal shelters, police precincts, general stores, community centers, newspapers, radio stations, churches, and park rangers. She is tireless. The local paper in Waynesboro, Virginia, writes a small story about the family’s search. The story hits the AP newswire. Tips—many of them of questionable authenticity—pour in from across the country. But as the search continues, the Marshalls realize they may not survive losing Gonker. Even as the wounds of their past return to haunt them and threaten to jeopardize everything, they know they have one mission: bring Gonker home. 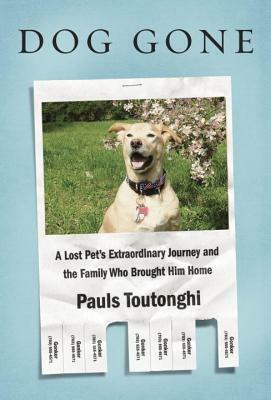 With a big heart, intelligent humor, and a deft touch, Pauls Toutonghi tells this true tale of loss, love, and resilience. Dog Gone is by turns a story about how a family comes together in a crisis—and the way heroism can assert itself in the little things we do each day. PAULS TOUTONGHI is a first-generation American. He has been awarded a Pushcart Prize, and he has written for The New Yorker, The New York Times, Virginia Quarterly Review, Granta, Tin House, and numerous other periodicals. He lives in Oregon, where he teaches at Lewis & Clark College.